The Transportation Investment Advocacy Center’s second 2015 report on state transportation legislation is now available. Twenty-one states are currently considering transportation funding legislation, with more expected as the year progresses. TIAC staff has tracked 48 transportation funding bills introduced in 2015, with over 70 bills in total pending legislative action. Eleven states— Ga., Iowa, Mich., Minn., Mont., N.J., N.M., S.C., S.D., Texas, and Utah— are currently considering legislation to increase their gas tax or sales tax on gasoline, with more anticipated in the 2015 legislative session. Additionally, Michigan voters will decide on a ballot measure in May that would result in a transportation funding increase. Three states— Conn., N.H., and Texas— are currently considering legislation to protect their transportation funds. Two states with variable-rate gas taxes— Ky. and N.C. — are considering legislation to instate a “floor” on the tax in order to prevent it from collecting below a minimum amount. 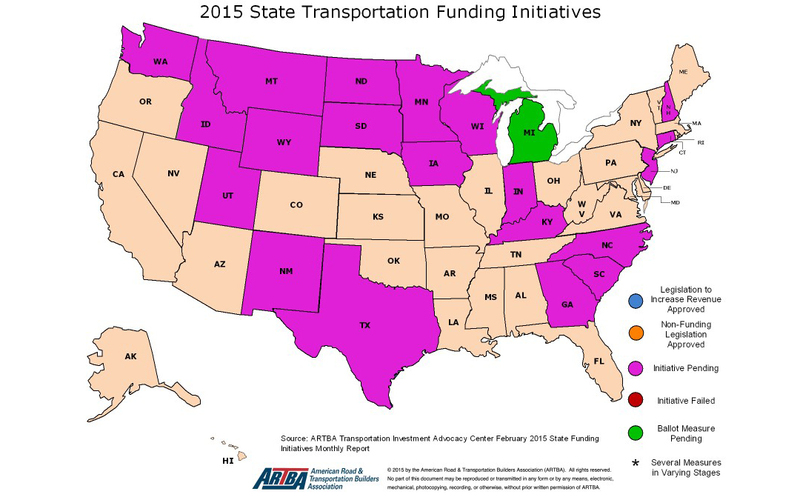 Read the full report of 2015 proposed transportation funding initiatives.